Species with declines close to these threshold values often change category between years. Discussion tables A1–A3, however, indicate just six changes to the long-term alerts since BirdTrends 2014. A CBC/BBS trend for Nightingale has not previously been calculated. It indicates high alerts for population decline over the 46-year and 25-year periods. The species was upgraded from amber to the red list in 2015. For House Martin, the 25-year CBC/BBS decrease of >50% is now statistically significant and so, like the 46-year trend, raises a high alert. House Martin remains amber listed after the 2015 review. For Little Grebe, the 25-year WBS/WBBS decline of >25% has become statistically significant and so raises an alert. The species was downgraded from amber to green in 2015, although the long-term WBS/WBBS trend raises a high alert. For Garden Warbler, the significant 25-year CBC/BBS decline has now passed the 25% threshold, raising a population-change alert for this species for the first time. 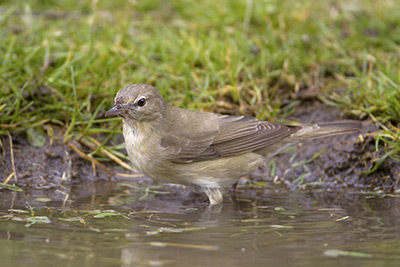 Garden Warbler is green listed. For Tawny Owl, the 25-year trend has dropped to <25% and so no longer raises any alert. Tawny Owl is amber listed. For Tree Sparrow, the 25-year change is now less than a 50% decline and so raises only the lower level of alert. Tree Sparrow is red listed and its long-term decline remains severe. Amber and red listings use similar criteria and have only just been reviewed. This report, using a further year's data not available to BoCC4, already suggests potential updates to current conservation concern for House Martin, Little Grebe, Garden Warbler and Tawny Owl. Alerts from WBS/WBBS (Table A4) are unchanged except that the decline for Sedge Warbler has passed the 50% mark and consequently now raises the higher level of alert. For CES there are additional lower-level alerts for Greenfinch, Song Thrush and Whitethroat over the 25-year period and for Whitethroat also over the full CES period (29 years).